Stainless steel alloy choices for silencer construction. Post subject: Stainless steel alloy choices for silencer construction. Some data, thoughts & questions on stainless steel alloys for silencer tubes. Most cans I see made from stainless steel use either 304 or 316 for the tube. This is understandable since they are readily available in seamless tubing and they have good corrosion resistance. The main caveat I see for these alloys is they do not have great yield strength, in particular as things heat up. Below are some 0.2% yield strengths for the alloys from this source. For some perspective 1000 F is a very dull red heat and is a temperature that can be reached with a silencer running 223/308 in fast semi auto (3 mag dumps?). This chart gives a good visual representation of temperature. From the yield strength data 316 looks to be marginally better than 304 (24 k vs 14 k PSI @ 1000 F). What are the opinions on 316 being stronger than 304 in suppressors? Is there a sufficient difference in strength to be useful? There are better stainless alloys available for suppressor use. The one I see most often is 17-4, a precipitation hardening steel. I have used this alloy for a lot of projects including baffles on a form 1 build. There is a range of hardness and strength with this alloy depending on the heat treatment used. The strongest and hardest grade is obtained by heating annealed 17-4 to 900 F for 1 hour then letting it cool in still air. This provides a hardness of ~43 Rc and a yield strength of 170-190k PSI. This is referred to as H900 17-4. The least strong and hard grade is prepared by heating to 1150 F for 4 hours. This provides a 35Rc and a yield strength of 150k PSI and is known as H1150. There is essentially no warping from the heat treating process but there is a very small shrinkage in the range of 0.0005 to .002 inch/inch for the H900 & H1150 respectively. This type of heat treating can be done using a small pottery kiln. This alloy has very good corrosion resistance, comparable to 304 SS, but where it really performs is in yield strength compared to the 300 series SS. Here are the yield strength ratings for this alloy from this source. As you can see this alloy has 2-4 times the yield strength of 316 SS at all temperatures and 4-6 times that of 304 SS. This leads to the question of the gains that can be had in using 17-4 instead of the 300 series stainless steels. 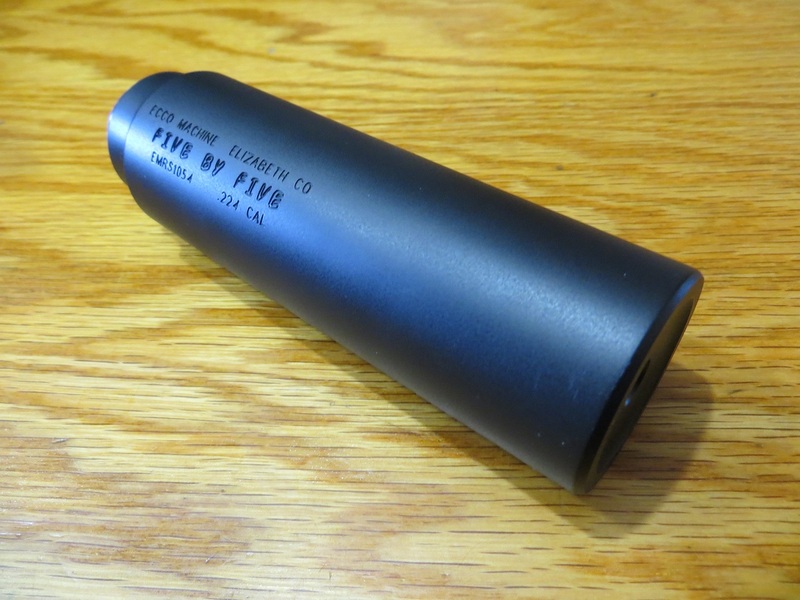 If a typical 1.5in OD rifle silencer made for 223 or 308 pressures has a wall thickness of 0.065in using 316 SS how thin can a similar can be made using 17-4 SS? The yield strength of 17-4 would suggest a 0.035 wall to be at least strong as a 0.065 wall 316 SS can. This would cut the weight of the tube in half. Using 17-4 for other components would suggest a similar savings in weight. I’m not a mechanical engineer (I’m a chemist) so perhaps I’ve oversimplified the analysis using just yield strengths. I would like to hear from those with a background in building silencers their thoughts on alloy choices and in particular the advantage of using an alloy like 17-4 over the standard 300 series. Post subject: Re: Stainless steel alloy choices for silencer construction. 17-4 is a wonderful material, I use it for all the baffles in my 5.7 full auto and handgun suppressors. I use it for all the baffles ahead of an Inconel blast baffle in my centerfire rifle cans and also as the tube material for the centerfire cans. You are right about the ability to make the baffles thinner to save weight. I do not use 300 series stainless for any baffles, the only 300 series I use is 316L for my rimfire and handgun tubes. I machine the 17-4 in the H900 state to save the need for heat treating after machining. The way I look at it the next step above 17-4 is Inconel which will handle the heat better in the blast chamber and resist erosion better but is not stronger than 17-4. For me, getting the weight down on my form 1 builds is a challenging goal. If I can use 17-4 to half the metal needed that could make a very significant difference. The potential here is to cut the weight of a 316 SS suppressor in half, that's a big improvement. The question is can you cut the component thickness in half using 17-4 and maintain the same overall strength as a heavier 316 build? The yield strength says yes, but does the yield strength track as a linear function as you cut the dimensions in half? Some parts you can make it 50% as thick but there are certain areas to leave them thick still, a couple of examples would be leaving the blast baffle the normal thickness and I would leave some thickness right at the bore so you have some material there to allow for erosion but in the structural parts of the baffle you can thin them out some. On my centerfire cans I use a .04 wall thickness. I like to make my rear cap and blast chamber all one piece with a. 050" walls the blast baffle is welded into the blast chamber then this is slid into the tube. In this case if you used .035"-.040" for the main tube and blast chamber that would effectively make the area in the blast chamber .070"-.080" thick. Rather than make a series of cones with spacers you could tack weld them in place dropping the weight from the spacers AND increasing the internal volume. Make your first baffle .080" thick , .065" for the second and .035" for the rest. And that would be for what caliber / barrel length? I like the idea of using 17-4 but I have no way of heating a baffle up to 1000 deg f for an hour. why are you annealing the material ? you only have to anneal if the material has been work hardened, free machining is not work hardening the material annealing brings the molecule back to its original state of 0 temper which again is not needed unless its work hardened. Sorry for dredging up an old thread but I have a question on the 17-4. I’m waiting on my F1 approval and doing some research and came across this thread. My plan is to bore out a piece of 17-4 bar stock that was mistakenly sent to me several years ago by a metal supplier, so it was free. Can will be shot on .223 up to 280AI. 2.125” blast chamber, with 9, 60° cones. Wall thickness will be .065” in forward section with baffles, and I’m thinking .100” in blast chamber. I won’t be using a rear spacer in blast chamber, I’ll leave a shoulder at that point while boring out baffle section. My question is about the blast chamber. Is .100” thick enough in this area. Blast chamber will be 2.125 long and can will be mounted on SiCo asr brakes. The bar stock is in the Annealed condition. Baffles will he turned from 17-4 as well. Thanks for any advice and info. "Wall thickness will be .065” in forward section with baffles, and I’m thinking .100” in blast chamber." Based on the yield strength of 17-4 your wall thickness is way over what is needed for even a magnum rifle cartridge. I would cut those numbers in half for your intended use. For the baffles follow what curtistactical posted on wall thickness. A word of caution. 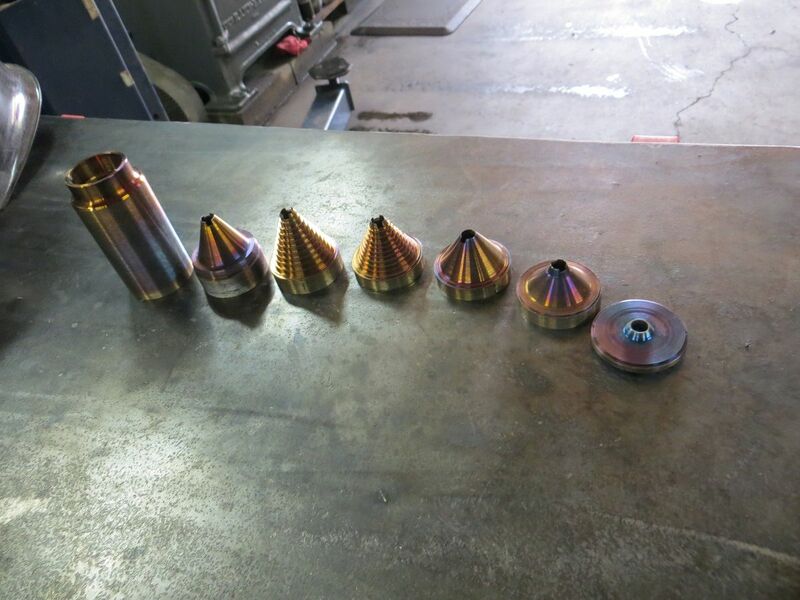 Boring a solid bar of 17-4 SS to make a silencer tube is not an easy job.You will need a very robust lathe and thick boring bar, preferably made from tungsten/tungsten carbide to minimize deflection. Controlling chatter as you bore the tube, it will be 'screaming' from harmonic vibration, will also need to be necessary. Without the required tooling & skills your chances of success will be very low. I have a 3 tubeless models, two of which are made by boring a length of bar stock to form a homogenous mount and blast chamber. The smaller one, a heavy duty 5.56 critter, is made from 17-4 H900. The blast chamber walls are .045", holds up just fine to heavy full auto fire from my 10.5" M16 postie. On that note, the blast baffle, which is also 17-4 H900, has a .070" thick cone. The pressure the tube can endure is one thing, blast baffle erosion quite another. Need to leave the thread area a little larger just as insurance. Probably won’t matter but it will make me rest easier on a F1 can that I can’t legally repair. Should be able to lose 5-6 oz on tube alone. it will make me rest easier on a F1 can that I can’t legally repair. An F1 maker can legally repair a silencer. What you can't do is make replacement parts. Damage the threads and you can legally shorten the tube, re-thread, remove and destroy a baffle (so not to have a spare). Honestly, for centerfire calibers, you don't need it serviceable. Never a need to open it up. Build a welded tubeless and save even more weight. The blast baffle on that model is both threaded & welded. The threads are proud of the wall ID, still leaving .045" wall thickness at the thread root. Obviously that wouldn't work if you're trying to slide baffles into a serviceable can, though. You'd have to dogbone the exterior profile.